The end of the year brings thoughts of resolutions for the coming year, making peace with the year that we've just experienced and, of course, a New Year's Eve party. Any New Year should have an obligatory bottle of Champagne to celebrate, whether it's a sweet California sparkling wine or a crisp and dry tête de cuvée from one of France's Champagne houses. Bubbling wine is both a tradition and a joyful way to count down to midnight. Here's the lesson part. The differences in wine with bubbles is simple. True Champagne comes from the small region in northern France and sparkling wine is from the rest of the world. There are a few names for the ones found outside of Champagne. In Germanic areas it is called Sekt, in Spain it is Cava, and in California it is called whatever they want to call it. You may see some wines that aren't from France labeled Champagne. It's their right to do that, but in my opinion, they are charlatans and should be flogged with a grapevine branch. I have had jobs that have afforded me the luxury of trying a lot of great wines. I have tried most Champagnes and sparkling wines that are available in the US, and a few that aren't. I've tried some of the heavy hitters like Roederer's Cristal, Dom Perignon, Veuve Clicquot, Bollinger, and Taittinger. While those were all fantastic, one sparkled a little brighter than all the others for me while costing the same or less than these great wines. It was from France's first established Champagne house that often gets overlooked here in the US, but it shouldn't. It was Dom Ruinart's Brut Rosé. I used to have a bottle of the Non-Vintage (NV) Brut Rosé sitting in my wine cabinet waiting for me to set it free. I was waiting for a special occasion and realized special occasions don't come often enough so I should just open it now. And I did. And it was great. The ritual of uncorking a Champagne is a different one for me. I don't see how loud I can make the POP, but I try to make as little noise as possible. Technically, the less it pops, the more bubbles are retained in the wine. Is it enough for you to notice a difference? Probably not. I just do it for the weird satisfaction of opening Champagne without the whole party knowing. It gives me the chance to have an extra glass before everyone sticks their glasses in for a taste. Dom Ruinart's Brut Rosé was light, crisp and fruity while still remaining as dry as Brut can be. There were thousands of little bubbles dancing around popping the subtle flavors. The aroma from the glass is intense and fruity with fresh ripe cherries and red berries. The flavors translate from nose to tongue and is followed by a hint of Spring flowers. The overall experience of this Champagne was heavenly. I was eating some great French and Belgian cheeses while enjoying the wine, but I could have been drinking it with nothing as I watched the Times Square ball drop. 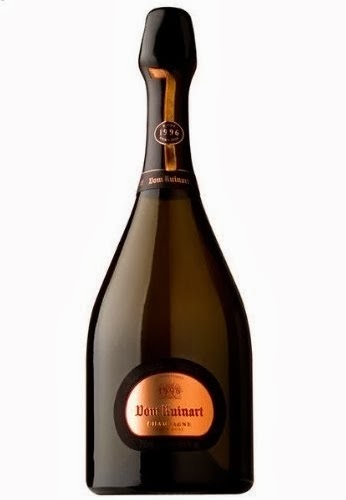 If you celebrate the New Year and like a good Champagne that is worth a special occasion, try Dom Ruinart's Brut Rosé. You'll be a better person for it. Cheers. Here's a bit of boring geography. In southeastern France, there is a strip of land that grows grapes that make my favorite wines. The Appellation d'Origine Contrôlée, or wine region, is collectively known as Burgundy or Bourgogne. The northernmost area of Burgundy, within the Côte d'Or, is the Côte de Nuits. Collectively, the area masterfully makes the best Pinot Noir in the world. Most of that was merely to let you know that I know where the wine I'm reviewing comes from. My lesson about the globe is over. Now, onto the wine. Kermit Lynch is a wine merchant who travels Europe's wine regions looking for wineries that have outstanding wines, but may not have the means to distribute their wines efficiently or at all. The Gachot-Monot vineyard was such a find for Kermit. He saw that the area near the town of Corgoloin was ripe for the picking. (Pun intended.) Damien Gachot works the vineyards and makes the wine. Kermit Lynch brings it to the world. 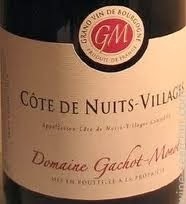 One of the fantastic wines that has made it across to America is the Domaine Gachot-Monot Côte de Nuits-Villages. The "Villages" at the end means it's more like a casual table wine rather than the super expensive wines from Beaune or other pricey areas. It's still nothing to snub your nose at. I got this bottle for just over US$30. I had the distinct pleasure of sampling the 2011 vintage tonight. It emerged from the dark bottle the color of a flawless ruby. You could see through the glass, the wine and make out shadowy shapes on the other side. This was certainly not a deep, heavy wine that is prevalent in Bordeaux. It was light, easy and perfect. As with most French wines, there is a complexity to it that is hard to describe without sounding like a complete loon. There are hints of strawberry, cherry, limestone, mushroom, blah blah blah, typical aromas and flavors that wine experts impart on French Pinot Noir. The only thing you need to know is this wine is simply exquisite. It has a mild tannin structure so it doesn't make your face pucker. It has a bright fruity taste, but not sweet or jammy like some Pinots from California or Australia. The overall effect of the wine was that it made a hectic day fade into oblivion. I was going to pair it with something from the kitchen so I could tell you how it could be matched up. What happened was I just drank the wine and forgot to grab something out of the deli drawer. Even after drinking the wine by itself, I can still make a judgement call about what you can pair it with. Plan on a great meal of lamb, pork loin, or game birds (quail, pheasant) with some veggies, a little smoked Gruyere and bread. The upscale, but not ridiculously expensive, wine will match an upscale but not expensive dinner. Or, if you're really a mutton head like me, just sit on your couch and drink it while you're watching food shows on the telly. Love a French wine today. This French wine. Cheers.